After the preliminary announcement that 2019 Harley-Davidson Sportsters and Softtails originating from its assembly facility in Thailand would see a reduction in prices of H-D motorcycles sold in Malaysia, an updated 2019 Harley-Davidson pricelist has been released. Compared to pricing from the year before, average pricing across the entire model range for plain black Harleys has dropped by 10.41% while wanting a piece of Milwaukee iron in colour netts the rider an average 12.5% discount. Going up the range for two-tone bodywork drops average of 9.19% while the Custom colour range remains mostly unchanged. New for 2019 is the addition of the Custom Two-Tone range, of which several models across H-D’s Touring, Softtail and Sportster range are represented. Biggest saving is seen in the Softtail series, with the 2019 Fatboy 114 discounted by 29% from the 2018 price. H-D Malaysia sees the Fat Boy leading the charge for CKD Harley motorcycles with the colour version of the Fat Boy similarly discounted by 28% and the entire Softtail range is discounted by an average of 23% compared to last year. 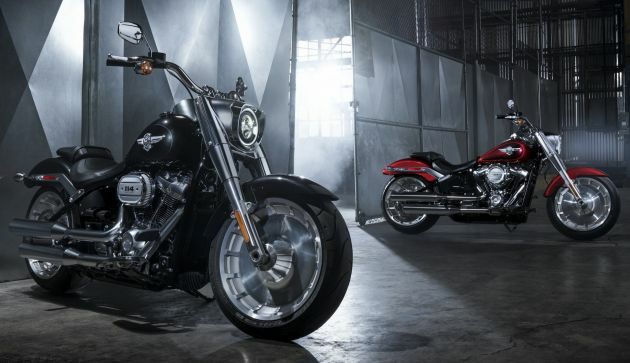 As for the Sportster range, the average discount is 18%, with the XL883N Iron seeing a drop in price from RM86,072 to RM68,200, a reduction of 20% with the Forty-Eight dropping in price by 19%. The cheapest new Harley-Davidson you can purchase in 2019 is the Sportster XL883L Super Low at RM62,600, down from RM76,426 in 2018. The most expensive Harley-Davidson you can buy in Malaysia, depending on accessories, is the FLHTK Ultra Limited in custom two-tone paint at RM238,200 and the FLTRU Road Glide Ultra, similarly priced. Harley-Davidson Malaysia currently has branches in Malacca and Penang with the flagship showroom located in The Gasket Alley, Petaling Jaya. The post 2019 Harley-Davidson Malaysia price list updated appeared first on Paul Tan's Automotive News. 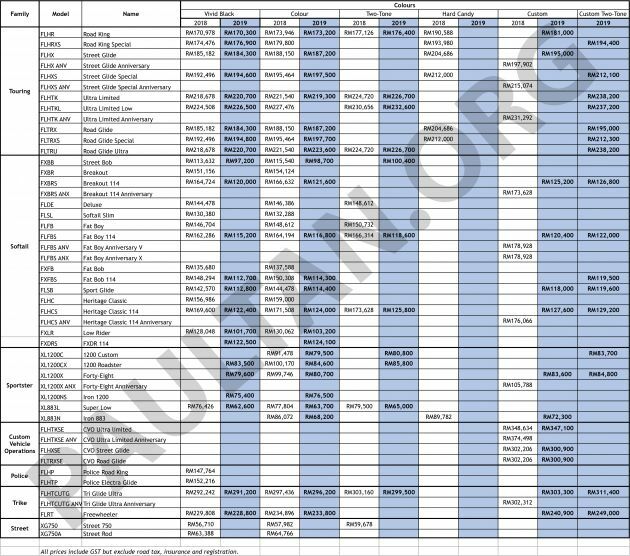 0 Response to "2019 Harley-Davidson Malaysia price list updated"